Netgear's Storage Central - Model SC101 (£79.98 inc VAT) is a hard disk enclosure with built-in disc controllers and networking features. This device emulates one or more logical drives using one or two physical IDE or PATA hard disks and provides a shareable storage facility accessible by all windows computers on a DHCP enabled network. A Storage Area Network (SAN) is a collection of storage devices linked to the local area network which are accessed and administered as one central pool, such storage does not require a specific computer to be running for file sharing. 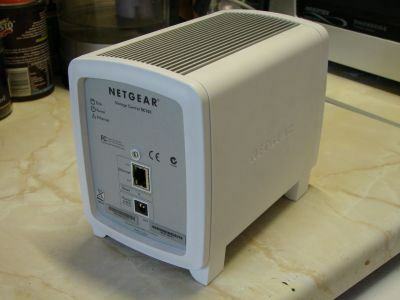 The device is attached to the network switch or router and acts like a file server for all the windows computers. However, unlike most other network storage devices, this one requires a client to be installed on each computer in the network. The basic unit is supplied with 0, 1 or 2 drives costs £68 + VAT in the U.K. for the empty box and £92 + VAT to include an 80gig hard drive - the storage can be bought separately, or you can add your own existing hard drives to the ‘empty’ box. This unit provides both Redundant Array of Independent Disks (RAID) level 0 & 1 and can be expanded indefinitely. SmartSync Pro advanced backup software is included which creates real-time copies of stored data from the clients. This product is well suited for sharing and back up with the simplicity of using a local drive. Easy to set-up and install, connect to any wired or wireless router (54G Wireless Ethernet Adapter) or switch. You MUST use the included software. Although the device is capable of listening on port 80, there is no web interface to configure it. The included software only supports Windows. Data transfer (read or write) about around 3MB/s. (this should be more like 10MB/s. This unit only supports simple security, ie a single password for each "logical drive" configured during set-up, probably because this is designed for the home market. I would not recommend use of this product if you value your data. A real piece of junk. Mirror breaks frequently - both HD's are fine! Trying to work using 1 of the HD's & creating 1 drive - still no joy as it keeps losing the drive letter half way through transfering data to it. I've upograded the firmware & tried several times to copy data across & now I have to say I'M GIVING UP! Do not buy this product at all... it really is not worth your time! Worst piece of tech I ever purchased. Not fit to be used for any purpose whatsoever. If you are using one should just backup to external drive, remove the internal hard drives and use for some other purpose and throw enclosure away before you are sorry. It gets at least a 2 just for being one of the first such designs on the market, that is also why it probably just gets a 2. 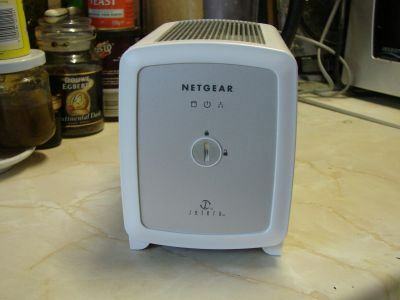 I have spoke to Netgear on mine. My box shows "works with Vista" and has a "Vista capable" sticker. Only to find out not my flavor of Vista. This is just plane deceptive. I don't care to much for Vista (64-bit) but it's what came on our laptops. I already spoke with Pat Lo and Feman Kalaw. BBB.org is my next hope then go to small claims for a fix or refund. It's only 6 months old. The little piggy, or if you prefer, toaster, is nifty product when used as intended. Sure Netgear has suffered the slings and arrows of outrageous reviews for the kinks it has yet to iron out. In all fairness, though, where can you get such a versatile storage device for that price? Once you realize that this isn't a NAS, and isn't enterprise level storage, the battle is nearly won. How many race car drivers use unleaded regular gas in their Indy cars? People, this is a consumer product! Don't try running your fortune 500 company on it! One of the big failings in the product, however, is the lack of Mac compatibility. Well no more! A company named Newt Data Systems has a storage manager package that allows your Mac OS X system to work with your SC101 or SC101T. Files and volumes created with Netgear's SCM can be accessed and shared on any Mac running OS X Tiger or Leopard. In addition, there are a number of features in Newt's Mac Storage Manager that Netgear forgot to include in SCM -- like the ability to recover from a "broken mirror". Check them out at www.NewtData.com. It arrived in my life so innocently, perfectly formed body, such poise such promise the answer to my dreams, little did I know the evil resentful feelings of hate it would invoke in me……I’m in therapy now and want to be a tree…………………………………. Took me two whole nights to archieve nothing from this toaster looking thing, not worth a space on my network..
Get netgear to get this garbage out of the market for christ sake..
Biggest waste of money I have ever purchased. A case of leaping before I looked. I should have done my research. I happen to have a Dual Wan Netgear Router and I love it. I thought NetGear was reputable and I trusted them. So ok - they are allow one or two lousy products and the SC-101 is the WORST!!! Without question the biggest pile of poo I've ever purchased. Plus their support is, well, a joke, and that's being knid, clueless twats. Shall not be buying any other netgear stuff. They can't be in business for that much longer. Unfortunately, you cannot give a zero score. Do not under any circumstances buy this product if you want to retain your sanity. Mine did all the nasty things others have described - including stopping windows closing down properly. Support is so bad you cannot even call it a joke. 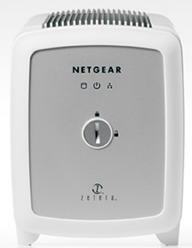 Netgear should take this product off the market. Of course, by the time you've struggled optimistically to try to get the the device to work, it's probably too late to get the seller to take it back. 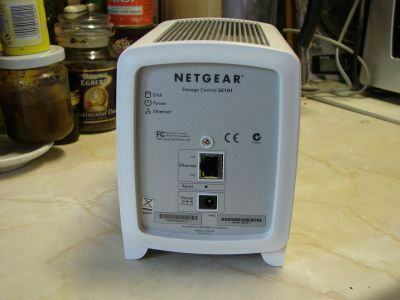 Must be why Netgear still manage to sell them on the basis of low returns. Best thing is it worked out of the box - no special drivers or software to set up, and if all else failed, I'd have a drive in it that I can read in other ways. Yes, we've all had our share of problems with this little toaster. I purchased this for one reason only...to have networked storage capability, using only one hard drive. I don't need mirroring, shares, passwords, etc, etc. And, yes, my unit also crashed at the beginning. However, I was smart enough to backup everything onto CD and DVD. I'm employed as a computer technician and have no problem getting into the "nuts and bolts" of this unit. Once I did my research and upgraded to the latest firmware and software, I've had no problems using the SC101 for my intended purpose: as a simple networked storage box. I don't really care if it uses a proprietary file system to access the drive. Reading abouth this file system sounds just fine to me anyway. As for transfer rates, what are you expecting?!! The maximum theoretical data transfer over a 100mb network is only 12.5MB/ss and 125MB/s for a 1000mb (gigabit) network. Yes, that's incredibly slow compared to a USB 2.0 drive with up to 480 MB/s transfer rate. Next, everyone must realize that you should be using drives with ATA6 specification, which corresponds to UDMA133, NOT UDMA100. I use Hitachi PATA hard drives, as I know they are ATA6/UDMA133 compliant. I even went so far as to replace the 40-pin IDE cable in the SC101 with an 80-pin UDMA cable for better signal integrity. Yes, this means I can only have one drive in the case, but this is of no concern to me. Finally, with the latest firmware, my drive does spin down and never gets more than just WARM to the touch. My advice to everyone using the SC101 is to understand that you get what you pay for...and that this really is an inexpensive unit. All the other NAS devices I've read about, of which the SC101 truly is not an NAS, has negative aspects as well. Some will only allow formatting as FAT32! My advice? Backup all the data on your SC101 to a folder on your computer, upgrade to the most recent software and firmware, install a UDMA133 hard drive (if yours isn't already) and start fresh. A bit of a hassle? Possibly, but this is what it takes to make it work properly. I mean no disrespect to all other users and hope that some of you might benefit from this. Seriously - do not buy one. I've lost track of the hours I've spent trying to get this thing to work reliably. Had all the symptoms others have - drives disappearing which cannot be ressurected being the main one - oh, and data corruption whne it was briefly working. The support provided makes you even more bad tempered. Just passed around from one person who didn't know what they were doing to another the same. It comes to something when you have to edit the registry manually to try to get the thing working. Have given up totally with it. I give it a 2, simply for the materials used. For the rest, only works on Windows (NOT Vista), due to drivers only written for that OS. No compatibility whatsoever with other filesystems (not Fat32, not NTFS, not even Ext3. Worked well, till they did their firmware and program update, suddenly one hd can be found, but refuses to be connected. Their support on the site is good, and well worth the read, IF you are still working with software version 1.5.6-7, as their solutions do not work with the software they themselves have written. If they can do it, why can't Netgear..??? It does make a nice (and expensive) 25 Watt room heater though. Yes I wish I had read this forum before I bought. At first it worked sort of OK. You could copy stuff on it but I was struck by how slow it was compared with a USB external drive. THe a day or so after Windows Explorer started crashing. By this time I was realising that things were not right on the system. After the infamous firmware upgrade I have now lost the drive letter. Will it return. I'll keep you posted. Regards and DONT BUY THIS PRODUCT. I cannot give a negative score. DO NOT BUY THIS PIECE OF JUNK. It is unreliable, gets scorchingly hot, and the latest firmware has a nasty habit of simply killing it. Combine with Netgear's woeful support, and total lack of interest in providing Vista drivers, this is the worst $180 I have ever spent on my PC. Complete waste of money. Given that it is a SAN not a NAS does anyone have some feedback on how it performs as a SAN? Proprietry fs is a worry - why not use a linux standard? Any other feedback? Worst Product Ever Made. DO NOT BUY if you don't believe me go to netgears forums and look at the amount of problems people are having. The device uses a proprietary file system that cannot be viewed by any other OS so if you have problems accessing the drive you can basically kiss your data goodbye. Also you have to install software on your computer in order to access the device. THIS IS NOT A NAS DEVICE. This does not work with Windows Vista, has some serious install problems, and you get non-English speaking technical support that is a complete waste of time. I am not sure what might be a better product to instead buy but I am sure there is one out there. This is a pile of crap. Their pitch for it is deceptive. You cant even use a preformatted drive in it. I have 2 full 500 gig drives and nothing to connect them to. Bought this thinking I could just pop them on the network...and I can, if I want to lose everything on them. Farking ridiculous....It's going back tomorrow. Whatever you do: DO NOT BUY ONE !! I had one, threw it out after about 3 months. Before you criticise others for being unable to write, it may be worth taking basic grammar and spelling lessons yourself. I too think this is a shocking product, way to loud for my liking! You cant even take good photos and you don’t know what your talking about. Please in future, learn to write before you contribute articles. It inly goes to show a lack of dedication, interest, and knowledge to both the product, and the industry as a whole.